Text & Photographs By Jon Massie © All rights reserved. Roaring Fork Motor Nature Trail is situated just outside of Gatlinburg, Tn. The road is approximately 7 miles long, but traverses many distinct areas. If light is good this area may take all morning to explore and photograph. The first area to stop at is the Noah "Bud" Ogle Place. Mature Dogwood trees give this cabin the charm many photographers return to year after year. Pre-dawn or early morning light is best for this cabin. As you continue along the motor nature trail you may wish to hike the 1.2 miles to Grotto Falls. Many compositions for photography of this falls can be accomplished. More homesteads are along this trail and each have their own charm and charisma. Early morning lighting conditions are best and if there is fog the images produced can't be beat. The stream that runs along the road during second half of this road is well-known for it's moss-covered boulders and rocks. Drive slow and look for dozens of blooming wildflowers along this road. Place of a Thousand Drips is near the end of the road. Depending on weather conditions, it can be either a trickle or a cascade of water. Newfound Gap Road traverses the park north-to-south. From Gatlinburg travelling south on this road, many quiet walkways can be found. The first area of interest is Campbell Overlook. Looking east, you will see Bull Head and Mt. LeConte. I've always enjoyed this view and it is a classic Smoky Mountain Scene. 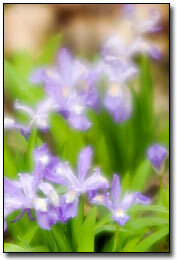 Spring snows do occur at higher elevations and can add drama to your composition. Next is Chimney Tops Picnic Area. If conditions are right, Fringed Phacelia can carpet the forest floor. Other species such as Yellow Trillium, Large-Flowered Trillium, Squirrel Corn, Foamflower and Violets can be found here as well. Concentrate on the uphill side of the picnic area. Further along Newfound Gap Road are many pullouts with vistas and overlooks. Of notable interest is Morton's Overlook. Recently named one of the top ten spots in the country for photographing the sunset. Here you will look into a deep valley and in the spring the sun will set slightly to the left. Be sure to arrive early as this is a popular spot. A fifteen minute drive from Newfound Gap is Clingman's Dome; the highest point in the park. A short .5 mile hike will take you there, though the sunset is best photographed from the parking area. 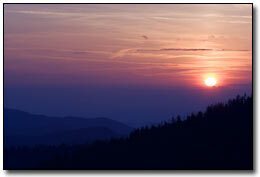 This area produces the most well-recognized scene in the Smokies...a sunset with layered mountains in the foreground. Arrive at least fourty-five minutes prior to sunset so you don't have to rush. Many photographers leave just after the sun goes below the horizon. Depending on conditions it may be worthwhile to stay a bit and catch the alpenglow. The long drive from a hotel or campground to this location deters many from attempting scenes such as this. But, if weather conditions are right, the view cannot be beat. No matter how much time you allow yourself to explore the Smokies, it never seems like enough. Constantly changing weather patterns allow for varied photography. 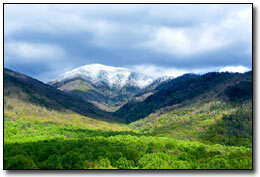 Although well-travelled, the Smoky Mountains quickly become a very wild place. Make sure you have a appropriate clothing for changing weather, a first-aid kit, plenty of water and a waterproof map. Basic preparedness will ensure your trip is a successful one. Click the author's gallery image on the top of the page to view the author's photographs. Uncle Tim's Bridge In Wellfleet On Cape Cod In Horizontal Or Vertical? I couldn’t decide which photograph of Uncle Tim’s Bridge in Wellfleet I like better… the horizontal or vertical. What do you think? If you’ve never gone over the bridge and walked the trail, it’s worth the walk. There is a nice overlook with benches where you can sit and enjoy the view. Beautiful Snowy Egret Reflection At Nauset Marsh On Cape Cod.